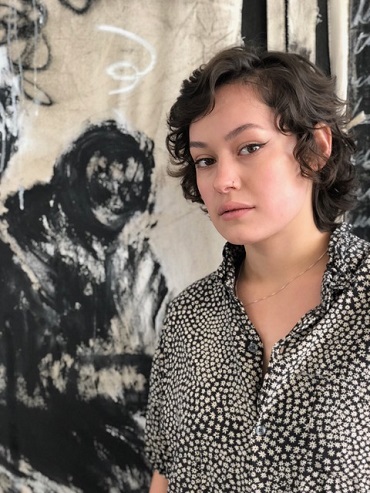 The Institute of American Indian Arts (IAIA) Foundation selected IAIA student Lorenza Marcais as one of this year's NMC Scholarship recipients. Lorenza Marcais acquired her superpowers through love: the love of nature, homemade tortillas, dancing, and traveling. Marcais, who is Mescalero Apache and Mexican, grew up among the road-runners, hummingbirds, and Pueblos of New Mexico. Marcais is a non-traditional student at the Institute of American Indian Arts (IAIA), learning to be a community outreach activist by pursuing her BFA in Museum Studies with a minor in Studio Arts. Marcais wishes to inspire families and their children to learn about themselves and our diverse world through art. An indigenous artist and future museum educator, Marcais is keen to collaborate with fellow artists, art therapists, teachers, museums, and community members in order to create unique moments of grace through educational and interactive art exhibits. The University of New Mexico Foundation selected UNM student Julianna Blake Massa to receive another of this year's NMC Scholarships. "I grew up in Las Vegas, Nevada, and moved to Albuquerque to attend school at the University of New Mexico. I discovered a passion for making and performing dance by taking classes at UNM. Dance interests me as a way to explore the world both internally and externally. I love the way that dance creates space for new ideas. I have performed in two faculty showcases and two student showcases, one featuring my own choreography. My dance practice keeps me curious about the world around me. After graduating, I want to continue to involve myself in the dance community that exists in New Mexico, both by performing and choreographing as well as working to elevate the status of dance in our state. " Highlands University Foundation selected Highlands University student Daisy Trudell Mills to receive one of this year's NMC Scholarships. Daisy Trudell Mills is a student at Highlands University studying Fine Arts with a concentration in Sculpture. She came up in a very art oriented family and began practicing art at a very young age. She attended the New Mexico School for the Arts before dropping out during her sophomore year. Daisy then enrolled in the YouthBuild program, where she worked in and became certified in areas of construction and obtained her GED. From there, she attended Highlands University, majoring in Fine Art. She is currently preparing to graduate in May with a Bachelors Degree in Fine Arts. Daisy operates out of her personal studio in Las Vegas, New Mexico. Tressa Smith is currently a student at New Mexico State University studying Theatre Arts with an emphasis in scenic design. During her first year of training in theatre, she found her way to scenic design (though she had to learn how to properly use tools first, as she had only used thumbtacks and a hardcover book as a hammer before.) She loves scenic design because it is her way of connecting to the characters in a script, believing that the environment surrounding a character is a direct response to that characters thoughts, feelings, and overall mentality. She is currently working as an instructor for A Children’s Theatre of Mesilla Valley and will be graduating in May with a Bachelors Degree in Theatre Arts.